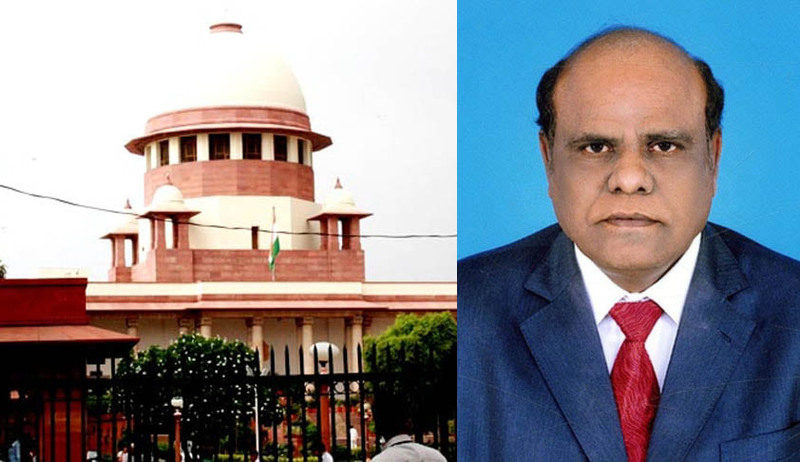 A Seven Judge Bench of the Supreme Court, comprising the Chief Justice of India, Justice J.S.Khehar and six senior-most Judges, will hear at 10.30 AM on Wednesday, a suo-motu civil contempt case against Justice C.S.Karnan, Judge of the Calcutta High Court. The case, listed in the Cause-list for February 8, has surprised observers, as it is for the first time that the Apex Court has taken seriously, a letter campaign against senior Judges of the Supreme Court and High Court by a sitting Judge of the High Court. According to sources, Justice Karnan last week circulated many letters making serious allegations against ​Supreme Court and High Court Judges​, and this has probably invited the wrath of the Apex Court, which wants to nip in the bud serious indiscipline in its ranks. In one of the letter addressed to Prime Minister of India he alleged that some illegal money has been recovered from some High Court Judges after demonetisation. He also alleged corruption against twenty High Court Judges. But questions are asked whether it would be a summary procedure, or due notice would be given to Justice Karnan to reply to the charges likely to be framed against him in this regard. Justice's Karnan was a party to many controversies while he was a Judge in Madras High Court. He was the first sitting judge in India to lodge a complaint of caste bias with the National Commission for SC/ST. In November 2011, his allegation that four-five high court judges had humiliated him on the basis of caste, led to an agitation. He had said that Dalit judges were targeted and their reputation tainted whenever they proclaimed their self-respect. Judge Karnan had set an example at that point in time by addressing a crowded press conference at his chambers in the high court, where he said he was facing humiliation and embarrassment since April 2009. In January 2014, while a special bench was hearing a PIL against the proposed appointment of new judges, he surprised everyone by entering the courtroom saying the selection is unfair and expressed his desire to file an affidavit in his name, as he was also a part of the judiciary. Later, he abruptly exited the courtroom. The Madras High Court registry moved the Supreme Court and Supreme Court had stayed the order passed by Justice Karnan. The Supreme Court had then transferred him to Calcutta HC. In April 2016 he stayed the transfer order issued to him by the Supreme Court of India transferring him to Calcutta High Court. He also directed the Chief Justice of India to file the reply. Later he was sworn in as a Judge in Calcutta HC.